another month, another daring bakers challenge. after last month’s wonderful hand-tossed pizza dough i was ready for something sweet and when dolores, alex and jenny announced that we would be making shuna fish lydon’s caramel cake with caramelised butter frosting i was delighted. i’d been craving a sweet over-the-top cake and this sounded just perfect. well, despite various warnings in the recipe about it being a tricky recipe to pull together, everything worked perfectly. on the advice of some fellow daring bakers i only made half the caramel syrup and frosting which was more than enough to provide a beautiful caramel flavour and frosting for inside and around the cake (the recipe below has my quantities). the cake had a very dense texture but was wonderfully light and kept really well – we ate this over 4 days and the final slices were still moist and delicious. the caramel flavour of the cake was quite subtle but more pronounced around the edges where the direct contact with the heat of the oven had intensified the flavour. as for the frosting, well, it was very delicious! the addition of tiny flakes of salt really bought out the caramel flavour and helped balance the sweetness. would i have tried this recipe if it hadn't been part of the daring bakers challenge? no, i wouldn’t have thought that caramel would be an interesting enough flavour. i’d also have been put off by shuna’s words of warning about this cake being all about the alchemy of baking and that real care is needed to achieve success. would i try this recipe again in the future? yes. 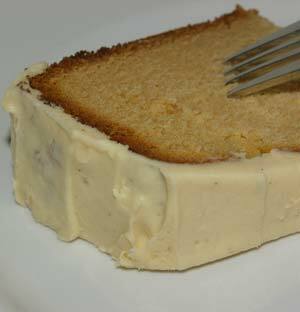 i loved the flavour of the icing and the cake was easy to make. it’s a wonderfully flexible combination and i love the idea of making cupcake versions. 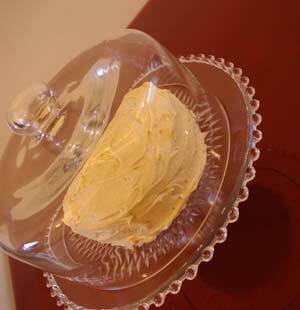 preheat oven to 175c and butter 9 inch cake pan which is c2 ½ inches deep. using a food processor, cream the butter until smooth. add the sugar and salt and mix until light and fluffy. slowly pour the room temperature caramel syrup into the bowl, mixing well and scraping down the sides regularly. add the vanilla and then the eggs a little at a time, mixing well after each addition. beat mixture until light and uniform. sift the flour and baking powder. on the lowest speed, add one third of the dry ingredients. when incorporated, add half of the milk, a little at a time. add another third of the dry ingredients, then the other half of the milk and finish with the remaining dry ingredients (this is called the dry, wet, dry, wet, dry method in cake making. it is often employed when there is a high proportion of liquid in the batter). when the batter is uniform (don’t overmix) fill your prepared cake pan and place in the oven. after 30 minutes, rotate the pan then cook for another 15-20 minutes until the sides of the cake pull away from the pan and a skewer inserted in middle comes out clean (my cake took c1 hour to cook so keep checking yours). let the cake cool completely before icing it, the cake will keep for three days in an airtight container. in a small saucepan with tall sides, mix water and sugar until the mixture feels like wet sand. brush down any stray sugar crystals with a wet pastry brush. place over the highest heat and cook until it is a dark amber colour – do not stir! when the colour is achieved, place a piece of foil over the top of your pan which you have cut a 1 inch hole out of in the middle. through the hole carefully pour in the water – the caramel will jump and sputter about but the foil will protect you! this is dangerous work so have long sleeves on and be prepared to step back. whisk over a medium heat until it has reduced slightly and feels sticky between two fingers. (obviously wait for it to cool on a spoon before touching it). heat the butter in a pan and cook until it turns brown (watch it carefully otherwise it will burn). pour through a fine meshed sieve or piece of muslin into a heatproof bowl, set aside to cool. pour the cooled brown butter into mixer bowl. add the icing sugar a little at a time, adding a bit of cream or caramel syrup when it gets too thick. repeat until mixture looks smooth and all icing sugar has been incorporated. add salt to taste. * i used less cream and more caramel syrup - just keep tasting until you get something you like the taste of. ** i used sea salt flakes which works really well if you like the sugar:salt contrast. use fine salt if you don’t want this effect.